Planes, Trains and Automobiles: What’s the best way to travel to Zermatt? Zermatt is one of the most beautiful and popular skiing destinations in the Alps. If you travel to the Swiss Alps, this resort boasts some of the best mountainous scenery and sits at the foot of Switzerland’s most famous mountain, the Matterhorn. Its slopes are some of the best in the world and the resort is both environmentally and family friendly. At first glance, Zermatt can appear to be difficult to get to. In fact, travel to Zermatt is far easier than you’d imagine. 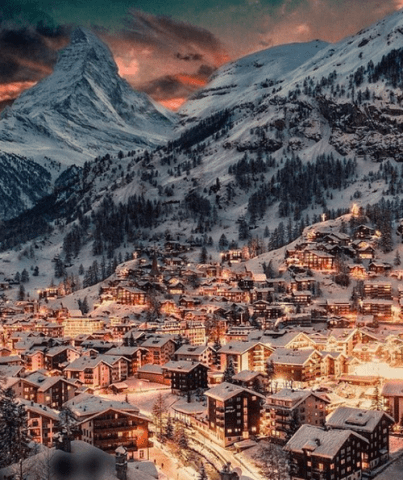 We’ve compiled a comprehensive breakdown of the best ways to travel to Zermatt, so you can focus on planning your activities when you get there! Zermatt is just a few short hours from several airports in Switzerland and Italy. You can fly to Zurich, Geneva, Basel, Bern and Milan airports easily and quickly. Swiss is a reliable airline that regularly flies to these destinations. Flights to Milan are often cheaper than to Switzerland but connections to Zermatt from there can take up to five hours. The benefit of Zermatt being close to different airports is that you can choose which one is right for you. For those anxious to get to the slopes as quickly as possible, the closest airports to Zermatt are Sion and Bern which are just 2 hours away by train. However, for those who want to take in the alpine beauty, the most scenic routes are from Geneva and Zurich. The resort’s website offers more information on flying to Zermatt. After you’ve flown to your chosen airport, Zermatt is just a short train ride away. The resort recommends arriving by train rather than by car, not only is this more environmentally friendly, but it also allows you to take in the beautiful mountainous views at your leisure. 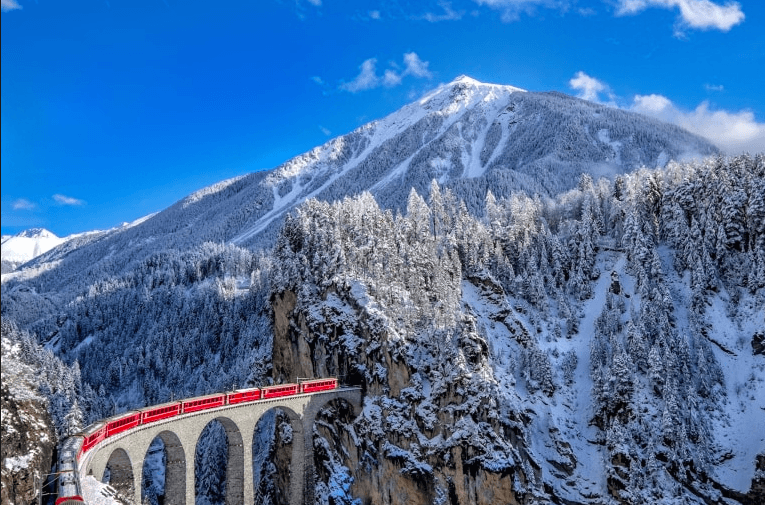 Once on the train, you are free to gaze at some of the highest mountains in Switzerland such as the Dom, Täschhorn and Weisshorn. We suggest you take a snap of the impressive Klein Matterhorn when passing through Täsch. Zermatt Train Station is easily accessible from all airports via the Glacier Express. You can find train timetables and prices on the website. One downside is that only Geneva and Zurich airports have railway stations. The other destinations are a short bus or taxi away from the railway line, but it does mean an extra step along the way. Swiss trains are well known for their punctuality, and comfort. So sit back, relax and enjoy the stunning scenery! Due to the sustainability policies of Zermatt, the resort is a car free zone. If you do wish to travel from the airport, you can park in the nearby town of Täsch. From there you can get a 12-minute shuttle service using the Mätterhorn Gotthard Bahn which departs every 20 minutes. Hiring a car is possible and can give you more independence, but it does tend to be the most expensive travel option. It is also a bit of a faff and goes against Zermatt’s green sensibilities. Or, why not book an airport transfer straight to Zermatt? This way, you avoid high car rental fees, it’s kinder on the environment, and you can hit the slopes in minimal time! Alps2Alps offer the most affordable and reliable ski transfer service which takes you from the airport straight to your resort. Let them know your group size and travel dates to get a quote today. Whatever method of travel you choose, we’re sure you’ll love what Zermatt has to offer!